There is sneaking suspicion that the U.S. directed the ongoing ISIS attack on Abu Kamal to gain control over the crossing and to disable road supplies from Iran through Iraq into Syria. The U.S. must be given no chance to use the ISIS pretext to take Abu Kamal. The Syrian government must rush to support its forces in the border city. It must immediately request that Iraqi forces cross the border from Al-Qaim and support the endangered Syrian troops. Some reinforcement came in and Albu Kamal was soon back in Syrian government hands. The Syrian army also launched an operation to destroy ISIS positions in southeastern desert. 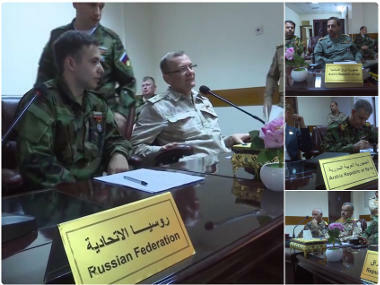 The Russian military is warning of a false-flag "chemical incident" in Deir Ezzor governorate. The Syrian Observatory reports that Islamic State remnants in the southeastern desert and in the Rukban camp, both under cover of the U.S. occupied zone around al-Tanf, prepare for a large attack on Syrian government forces. It claims that such an attack is an attempt to occupy the zone between al-Tanf and Albu Kamal at the Euphrates. 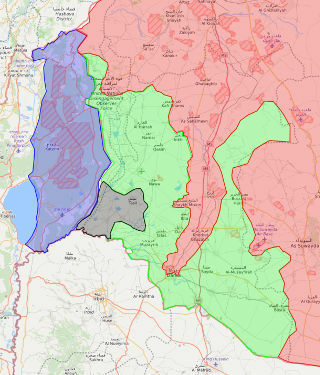 Both operation would be planned diversions intended to draw Syrian forces away from Deraa and could provide excuses for U.S. intervention on the opposition side. Late Sunday an airstrike destroyed a building in the Harri area near Albu Kamal directly on the Syrian-Iraqi border. The building was used as a headquarter for the Iraqi Popular Mobilization Forces (PMU) who are securing the border in coordination with the Syrian army in the fight against the Islamic State. More than 20 fighters were killed and more than 10 were wounded. This may have been in preparation for the reportedly planned large ISIS attack. A Syrian army officer was killed in a U.S strike on a Syrian army outpost near a U.S. base close to the Iraqi-Syrian border, a commander in the regional alliance supporting President Bashar al-Assad told Reuters. The Pentagon, said, however, that a U.S.-backed Syrian rebel group stationed in the Tanf garrison had engaged on Thursday evening an “unidentified hostile force” outside a “deconfliction zone” around the garrison, forcing it to retreat. It said there were no casualties on either side. The Syrian Observatory claims that eight Syrian soldiers were killed in the attack. There is some footage of a desert chase with "technicals" that is supposed to be from these clashes. They took place in al-Halba, 70 kilometers northwest of al-Tanf and only 50 kilometers from Palmyra. The U.S. sent "rebels" it trains at al-Tanf outside its self declared 55 kilometers deconfliction zone around Tanf to attack Syrian government forces. It supported them by air strikes. U.S. special forces are said to have taken part. This is likely the case as only U.S. special forces can call in such airstrikes. It seems obvious that the U.S. is using ISIS, U.S. trained "Maghawhir al-Thawra" rebels, and its air power in another attempt to cut the land route between Syria and Iraq. It wants to use the upcoming Syrian campaign against al-Qaeda and ISIS in the southwest around Daraa to make a new move in the east. [D]uring my visit to the city of Palmyra and its surroundings, the presence of thousands of Russian troops is striking, indicating that Moscow is sending new infantry and special forces in very large numbers. This large presence has not been announced. The Syrian army is also sending additional forces into the area and more Iraqi Popular Mobilization Units have arrived in the Al-Qaim/Albu-Kamal area. Syria and its allies obviously decided to counter the U.S. move. Their operations at the Syrian-Iraqi border are coordinated by the common operation room in Baghdad. 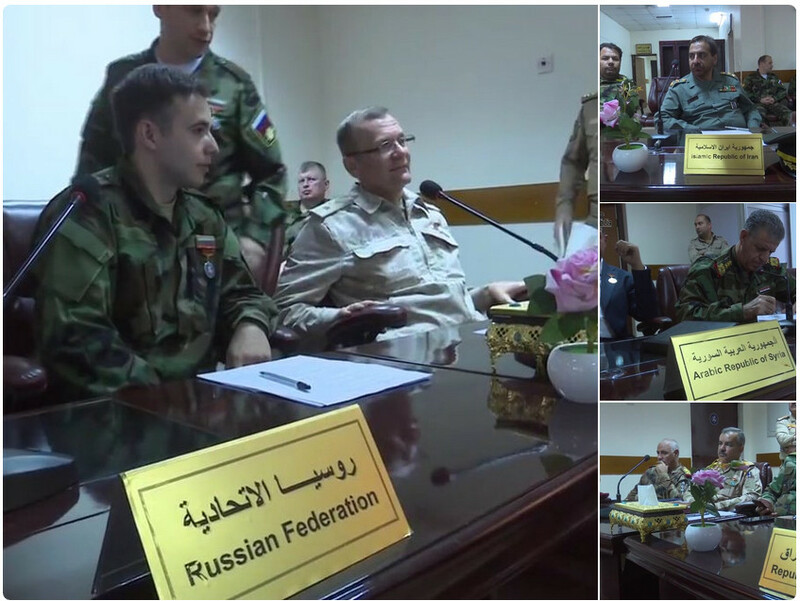 #BREAKING - #Iraq, #Syria, #Russia and #Iran confirm new mission to secure the #Iraqi-#Syrian border from all terrorist groups. The mission was devised in the operations room in Iraq's capital, #Baghdad. "All terrorist groups" include the Maghawhir al-Thawra "rebels" and their U.S. protectors at al-Tanf. Meanwhile the Syrian army continues its preparations for the large attack around Daraa which might bring it in conflict with Israel. The statement, however, omitted a line in a past statement on the subject that said the U.S. would take “firm and appropriate measures” if Syria violated the de-escalation measure. It has been confirmed that Iran will not be involved in the fight in Daraa (We had noted that three weeks ago.) Hizbullah special forces might take part in the areas near the Lebanese border. Jordan reinforced its position on its side of the border. It is unlikely to join any fight but it will want to keep fleeing "rebels" from entering the country. The operation in the southwest around Daraa will proceed. The U.S. attempts to use the occasion to cut Syria from Iraq in the east will be prevented by the new Baghdad operations room mission. Its high time for the U.S. to give up on its nonsense schemes in the southeast. The humanitarian situation in the Rukban camp near the U.S. positions in al-Tanf is catastrophic and the civilians there want to come back under Syrian government control. The al-Tanf position is indefensible against any larger force. The U.S. forces there can still move out without a fight. If they do not leave voluntarily, force will be used to remove them. Lajat area has been liberated and the SAA now controls Busra Al Harir. All going according to plan.. The American apologists here are whining about the Neocons' tactical mistakes in alienating other nations and driving their American Empire's adversaries together, but they fail to see that the problem is America itself--not just Neocons. Americans believe that they have a God-given right to rule the planet because they are a Force for Good or (just as ludicrously) a Beacon of Liberty for the entire world--even though this has never been true. This messianic belief in America is fundamental to US national identity and can be traced back to the Massachusetts Bay Colony--long before Neoconservatism existed. Because of this fanatical belief in their own Moral Exceptionalism, the Americans refuse to relinquish their unipolar dictatorship of the world. They cannot *honestly* accept the rise of a multipolar world, as it would necessarily mean an end not only to their parasitic economy and way of life (via the US Dollar reserve currency) but even the very basis of their national identity as the Shining City on a Hill. As such, they must increasingly resort to aggression, threats, and belligerence to maintain their geopolitical dominance. But imperial hubris produces imperial implosion. The Anglo-Americans will have to learn this lesson the hard way--and deservedly so. Let them reap at home what they have sown around the world. I'm all too familiar with all of that. I was merely correcting the false notion that the "Deep State" is anything more than one faction, or indeed several loosely grouped factions, among the elites who control the machine. Being a former Drumhead, it's nice to see an old Oil Drum entry being cited here. What's omitted from the entry is the existential crisis England faced prior to the item's chronological context--The Spanish Empire and its Armada which was made to subdue the piratical English and keep them within their rapidly denuded islands in 1588. If the Spanish hadn't been so damned inept and Drake so fortunate, history since 1588 would be very much different. Seems more people know of Japan's Divine Wind--Kamakazi--versus the Divine Protestant Wind that defeated the Spanish--an event not taught in US history classrooms despite its world changing importance! karlof!. I love the "Divine Protestant Wind" term! Have you read "Slave and Citizen" by Tannenbaum? It's a quick read that argues for the much more humane colonialism/slave system under Spain/Catholics than that of Britain/Protestants. And yes, "humane" is a rather fraught term to use when describing colonialism and slavery. But it's a fascinating view of the historical record and how that created the societies as they were in 1947. The deep state has a lotta history and many factions. I have adopted the view outlined by Joseph Farrell in his Nazi International, The Reich of the Black Sun and The Third Way, by Alfred W. McCoy in his The Politics of Heroin: CIA Complicity in the Global Drug Trade and by William Engdahl in A Century of War, Anglo-American Oil Politics And The New World Order. See also Peter Dale Scott´s writings. Essentially I am referring to a consortium of intelligence agencies, their bankers and the drug cartels who finance themselves off money laundering and resource expropriation. "The City of London is the money-laundering centre of the world’s drug trade, according to an internationally acclaimed crime expert." Now, the Department of Defense has announced it will conduct the first department-wide, independent financial audit in its history (read the Dec. 7 announcement here). The Defense Department did not say specifically what led to the audit. But the announcement came four days after Skidmore discussed his team’s findings on USAWatchdog, a news outlet run by former CNN and ABC News correspondent Greg Hunter. Thanks pogohere for a great collection of inter-related information. I understand that the publicly available documents Skidmore and his team accessed to compute that missing $23 Trillion have now been either taken down or heavily redacted. Though of course, copies were archived before going public. The missing Pentagon money from less than two decades is greater than the total national debt accumulated over more than two centuries. And yet, this real news gets no or next to no mention in the "news" of either MSM or "alternative" sources.